Odd-job queen Starshine Hart is about to go on somebody else’s perfect date. At twenty-nine, the usually carefree Starshine has realized that it is easier to start sleeping with a man than to stop. Her lovers include one of the last underground members of the Weathermen, and the dilettante heir to a lawn chair magnate. Both men have staked their romantic future on her. Her only respite is her impending dinner with the non-threatening but unattractive tour guide Larry Bloom. But Larry, too, has a stake in her future. He has written a book about their impending dinner in which he fantasizes about Starshine’s life on the day he wins her heart. 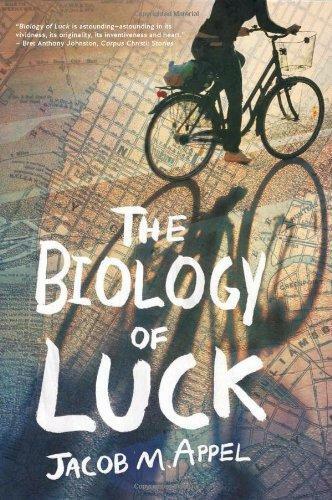 The Biology of Luck juxtaposes moments from Larry’s guided tour of New York City on the June day of his “dream date,” with excerpts from the novel in which he imagines Starshine’s concurrent escapades. This inventive novel-within-a-novel structure weaves a highly imaginative love story across New York’s five boroughs. Provocative, funny and keenly observed, Appel’s imagined pilgrimage through the underbelly of Gotham will establish him as a bold new voice in contemporary American fiction. A writer with more than 200 publication credits, a licensed New York City sightseeing guide, and scholar with multiple degrees in the fields of writing, philosophy, medicine and law, Jacob Appel is something of a modern day renaissance man. His first novel, The Man Who Wouldn’t Stand Up, won the Dundee International Book Prize U.K. Other books include Phoning Home, Scouting for the Reaper and Einstein’s Beach House. He’s won the Tobias Wolff Award, the Walker Percy Prize, the Kurt Vonnegut Prize, and others. Appel’s articles have appeared in The New York Times, Boston Globe, and Huffington Postand elsewhere, including law and medical journals. His plays have been produced in NYC and California. He is currently a practicing psychiatrist in New York City where he resides. When we first meet Larry Bloom, he’s striding up Broadway, the New York Times under his arm and a pack of cigarettes in his shirt pocket, musing about how there should be a civil rights movement for short, relatively unattractive Jewish men. What sort of first impression did this make on you? And how did your impression of Larry change over the course of the book? 2. What do you make of the André Aciman quote Appel uses as an epigraph? Which characters do you think it applies to? And how does it work in relation to Larry Bloom’s novel? We learn little tidbits of Starshine’s personal history throughout the novel, but that history, dramatic as it is, never really gets that much airtime. Did her history surprise you? How did your impression of her evolve as you learned about her past? Larry Blooms takes us through a good chunk of New York City, peppering his tour group with historical factoids while also trying to protect them from some disconcerting events. How does Appel’s New York City strike you—is he going for authenticity or hyperbole, or something in between? Of the three love interests in Starshine’s life (reciprocated or not), which do you think is the most appealing? And which makes the most sense for Starshine? How important do you think the book-within-a-book structure is to the overall book, and to your enjoyment or frustration as a reader? Can you think of structural comparisons from film, music, or art? At the end of chapter one, Larry tucks the letter from Stroop & Stone into his pocket without reading it. Why did Appel make this decision? Can you think of a time when you put off finding out important news like that? How would you classify Appel’s writing style? Are there other novelists, or periods, that his voice reminds you of? Appel has called the book a postmodern love story. In the afterword he explains, “While the structure is ‘postmodern’ in the spirit of Donald Barthelme or John Barth, that's not what I meant when I wrote of a postmodern love story. Rather, I meant that the love itself is ‘postmodern’—hyper-aware, ambivalent, fragmented. That's the world of romance that we live in today.” Has he accurately captured the essence of dating in the twenty-first century? What examples from the book, or your experiences, capture hyper-aware, ambivalent, and fragmented attempts at finding a mate? Theme is a reader’s word, and Biology is full of many of the big themes we find in good fiction. But one theme that Appel clearly establishes is stated at the end of chapter one. “He is happy, happy in the way he knows he can be if he wills away the inevitable and succors himself with the remotest of hopes. That is the purpose of his book. That is the subject of his book. That is the reason that the city rises from its slumber.” How is hope represented in the course of events that transpire on this one June day in New York City? All great art owes something to its predecessors. Appel has said he paralleled parts of his novel after Homer’s Odyssey and Joyce’s Ulysses. What links did you discovery between these seminal works and Biology? The most obvious question has to be asked—what is Starshine saying yes to, and what is she saying no to? Can you think of other books, or films, that end like this? Does that opened-ended mode work for you—why or why not?